The proxy server could not handle the request GET /_udayton/alerts/alerts.php. The University of Dayton will inaugurate Eric F. Spina as its 19th president April 2-5, with four days of events highlighting the university's faith, service, academic prowess, artistic excellence and community engagement, and introducing a bold vision for its future. The April 4 installation ceremony, the centerpiece of the celebration, will be non-traditional and fast-paced, with multimedia, song, dance and a few surprises, and feature two dozen members of the UD family and their thoughts on "This is Our UD." During the ceremony, Spina will be formally commissioned as president by the University board of trustees and the Marianist Province of the United States, and will share the initial outline of a strategic vision for the University, which emerged from a broad-based visioning process involving more than 1,000 people. Spina, who became University president July 1, 2016, launched the visioning process in the fall, bringing together board members, alumni, donors, faculty, staff and community leaders to explore what makes the University distinctive and what the University should work toward during the next 20 years. "I'm inspired by what I see and what I have learned about this extraordinary university," Spina said. "I don't want the installation to be just about me, but about how we got to where we are as an institution, and provide an authentic, rich and forward-looking experience that touches the variety of people in our UD family. "We've found ways to pull in contributions from everyone we touch." With a tradition of long-tenured presidents — this is only the third presidential inauguration in 36 years — the events will honor the University's past, growing from a small boys school into a top-tier research university, and chart a course for the future grounded in academic excellence, research prowess and community engagement. The events begin with a Mass at noon Sunday, April 2, in the Chapel of the Immaculate Conception, celebrated by Cincinnati Archbishop Dennis M. Schnurr, and end Wednesday, April 5, with an all-day showcase of student research and scholarship in the annual Stander Symposium. Along the way, faculty and community leaders along with nationally known speakers will explore innovation, humanizing technology and connecting the University's knowledge to societal and community challenges. On Tuesday evening, hundreds of UD students will perform in the annual Celebration of the Arts at the Benjamin and Marian Schuster Performing Arts Center. Only the second lay leader of the Catholic, Marianist university founded in 1850, Spina succeeds Daniel J. Curran, who stepped down in July after serving as president since 2002. Both Curran and his predecessor, Brother Ray Fitz, S.M., University president for 23 years, will participate in the installation ceremony. Spina previously served Syracuse University for 28 years, including nearly nine as vice chancellor and provost. He joined the Syracuse faculty in 1988 as an assistant professor and rose through the ranks as department chair, dean, and vice chancellor and provost, the university's chief academic officer. 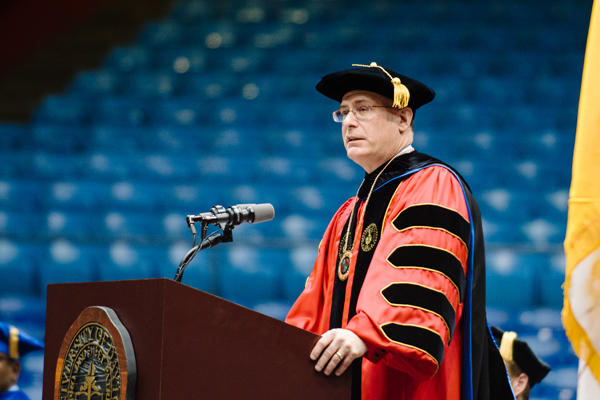 He also served as interim chancellor and president in 2013. For his bio see http://udayton.co/EBn. Events are free and open to the public, but registration is requested and tickets are required for some events. For more information and to register, visit go.udayton.edu/inauguration. Follow Spina on Twitter @DaytonPrezSpina, on Instagram at daytonprezspina, and his blog From the Heart.